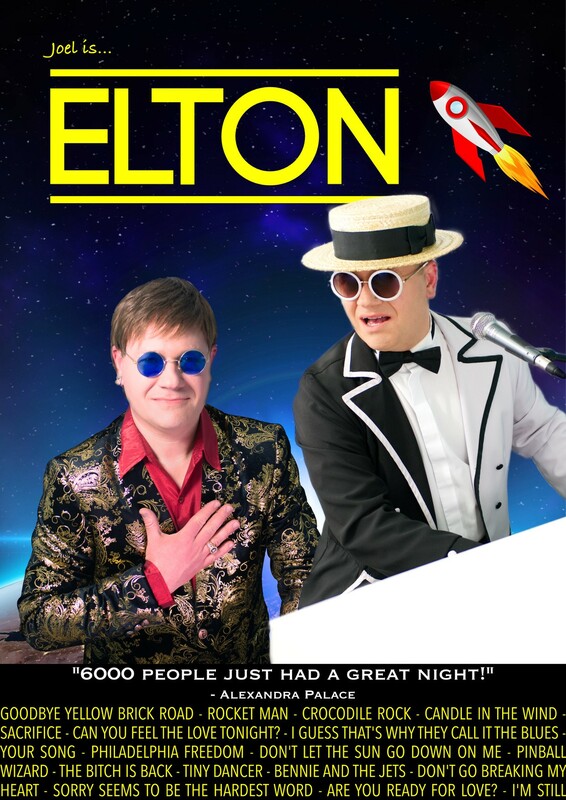 Joel has been performing as Elton John since 2008. As an accomplished pianist and talented singer he offers one of the most captivating and authentic tributes to one of the greatest icons of all time. Joel has performed all over the world from private birthday parties and weddings to cruise ships and hotels in the Middle East. He has filmed a spoof video with the Sun newspaper, entertained a huge crowd of over 6000 at Alexandra Palace and performed in front of 20,000 people. Tribute to Elton John Joels Elton John Tribute Shows are typically either 1 hour or 2 x 45 minute sets with several stunning costume changes and he comes self contained with a high quality sound system and lighting. His many satisfied clients include Lloyds TSB, Thomson Holidays, G Casinos, Marriott Hotels, General Electric, Warner Hotels, Intercontinental Hotels & Resorts and many more. Available as a solo performer (with baby grand piano and backing tracks) and also with a band. Joel performs all the best known Elton John songs wearing hand-made replica costumes.